Glebe Cpt Willie Beckett is looking forward to testing himself against Linfield on Tuesday 1st September in the JBE league Cup. .INBM34-15 026SC. 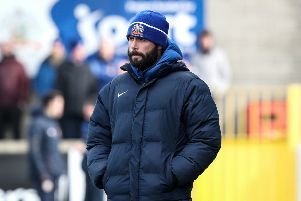 When Glebe Rangers come out of the tunnel onto the turf at Windsor Park tonight (Tuesday), Captain Willie Beckett will be hoping his team can produce a performance that will make not only the players themselves proud, but the large travelling support of friends and family too, writes Gillian Anderson. There is no doubting the buzz and excitement this fixture has caused at the club and in the town of Ballymoney but when the whistle blows it will all be down to the players on the park to do the club and town proud. “We’re all very excited,” said Willie. “There has been a great buzz since the draw and you could sense it in training. “We are champing at the bit to get at it and everyone has worked really hard throughout the close season. Many people worked hard in football but don’t get a reward like this. “Going to Windsor Park, especially at the moment when its looking so fantastic just adds to everything. “It’s hard to say how the lads will react, everyone will approach it differently, all we can ask is that everyone gives it their best shot, I know I certainly will. I think we will go and enjoy the experience. The results, as much as we want to give a good account of ourselves is somewhat secondary. We want to be able to go out there and give our best and play with commitment and pride. “Hopefully there will be a good bunch of fans. I know most of the players have family members coming to the game and the thing fore most in their minds is to play in such a way that we don’t let our families and supporters down.